Use Kingsford Charcoal Lighter Fluid to fire up the grill and fan the flames of appetite at your next BBQ. 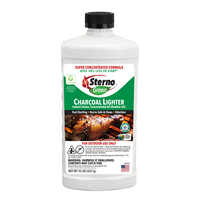 This lighter fluid is made with a high quality formula, making it the best way to light traditional charcoal briquettes and gets you grilling quickly. The odorless charcoal lighter fluid leaves behind no aftertaste, so you are guaranteed a delicious smoky flavor in your food, which gives your guest an authentic BBQ experience. It is portable and easy to use, just squirt lighter fluid as per container's usage directions, over the piled charcoal and carefully light a match. Once the charcoal briquettes are covered with ash, you are ready for grilling. Kingsford Odorless Charcoal Lighter Fluid is great for use when grilling beef, chicken, pork, seafood or veggies. Ideal for use in restaurants, cafeterias and other food service facilities. Add this odorless lighter fluid to your barbecue supplies and to ensure your cookouts are delicious. WARNING: This product can expose you to carbon monoxide and soot, which are known to the State of California to cause cancer and birth defects or other reproductive harm. For more information go to www.P65Warnings.ca.gov.